Chlorinated polyvinyl chloride (CPVC) is a thermoplastic produced by chlorination of polyvinyl chloride (PVC) resin, which is significantly more flexible and can withstand higher temperatures than standard PVC. Uses include hot and cold water delivery pipes and industrial liquid handling. SMARTFIT CPVC Plumbing system is designed for Hot & Cold water which is suitable for all plumbing and potable water application. It has a proven hot & cold water performance from 0° C to 93°C. Its corrosion resistance property makes it usable in all weather & ensures constant flow over lifetime. This system is used in industrial, residential, commercial & public complexes. Prince Pipes offers cost-effective and versatile lead-free CPVC pipes and UPVC pipes. CPVC Pipes are a great alternative solution to GI (galvanized iron) pipes and our comprehensive range of CPVC pipes and fittings will fulfil your every demanding application. and low rise buildings, corporate houses and academic institutes, solar heater applications etc. series as per IS15778. 20 and 25mm (¾" and 1") pipes are also available in heavy duty SDR 9. CPVC Pipes and Fittings are manufactured from compound i.e imported from a US-based company which is the world leader in compounding technology. CPVC- Chlorinated polyvinyl chloride is a thermoplastic used for hot and cold water lines. Ajay Flowline Plus is NSF certified – thus safe to be used for drinking water supply. Available as a complete system along with a complete range of pipes and fittings, valves and solvent cement. Ajay also ensures that its technical team is available to provide training and services round the clock for single family homes, large residential buildings, commercial buildings, hotels, andhospitals. Please download the Pricelist from the below link. 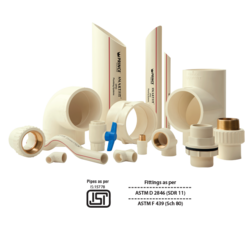 Looking for CPVC Pipes & fittings ?